The first soccer game I cried over wasn’t one I was playing in. It’s somehow different when you are in the game. Different emotions are involved. When you are playing, you are more engaged in the battle. And if the game is close, as a player you never give up hope. But if you are watching a game, involved as a spectator, you are trapped. Your emotions rise and fall with every missed opportunity, close call, and bad referee decision. It’s a completely different experience, and it can twist you into knots, sometimes making you unable to watch what happens next. 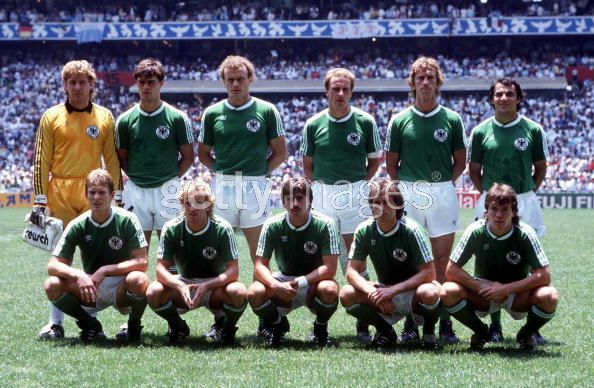 The 1986 World Cup was the first World Cup I watched. My brother and I were insatiable. For the opening rounds, our family was in Canada for the 1986 World Fair in Vancouver, but we couldn’t be bothered. I seriously think my father was considering throwing the hotel TV out the window. I had grown up listening to Alan Fountain commentate the TV show Soccer Made in Germany. This show would broadcast 50 minutes of a 90 minute match, with 10 minutes of “this is how life is in Germany” to round out the hour. While other kids were following the Dallas Cowboys, I followed teams like Schalke 04, 1. FC Köln, and Borussia Mönchengladbach. Sure I followed the NFL too – I am an American after all – but since I actually played soccer, it was somehow better. And since I have ancestors of Prussian extraction, plus the TV show, I grew up a fan of Germany’s national soccer team. Now I could have chosen to follow my long-lost relatives from Switzerland, Northern Ireland, Denmark, England, or Sweden – but there were no shows called “soccer made in Switzerland” that I knew of. I knew the German players from watching them each week, and so the die was cast. 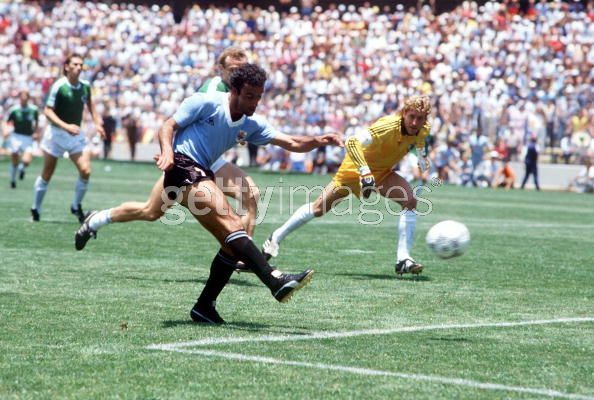 The 1986 World Cup Final was West Germany vs. Argentina. 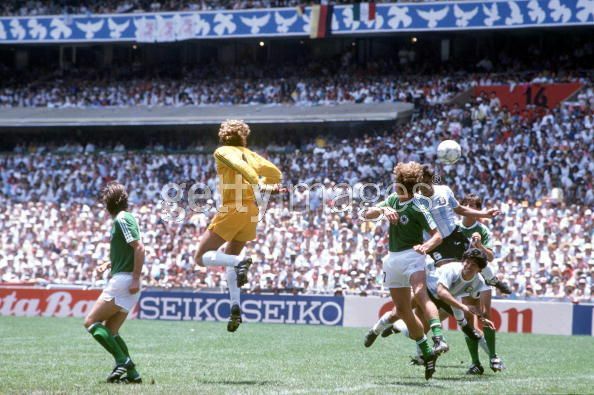 For the record, Argentina won, and I think Toni Schumacher (Germany’s goalkeeper) forgot to eat his Wheaties that day. He couldn’t save a goal to save his life, and he was at fault for at least one of the goals, maybe more. His performance that day still makes me angry. By early second half, Argentina was winning 2-0, and it appeared they were going to easily win. Argentina was bossing the game, and had taken advantage of Schumacher’s mistakes to build their lead. At this point I was bummed, but tears were not even on the horizon. If it’s not a close game, and no tragedy or near miss had befallen your team yet, there’s no chance of tears. By the time the Final was played, we had returned from Canada. My family was sharing a Sunday dinner at my Grandmother’s with other relatives. I’m not sure how many of them had heard of the World Cup, but my brother and I risked the wrath of our Mother to skip dinner and go to the cramped TV room to watch the Final. Then – finally! – Germany scored their first goal, late in the 2nd half. I let out an extra loud WAHOO! Aunts and uncles, brothers and sisters, and parents filtered into the tiny room. Could Germany complete the comeback and tie the game? We all held our collective breath as Germany poured forward, looking for the equalizer. Only 6 minutes later, they had done it! Germany had scored the equalizing goal! We were jumping, hugging, hollering, and yahooing as if we were actually from Munich. Just one more goal and the comeback would be complete! You know how sometimes you get so wrapped up in what you are doing that you forget about other people around you? Maybe you are so into a project that you don’t hear that it’s time for dinner, or you are reading a great book and can’t hear your daughter crying in the other room? I think that’s what happened to Germany. They were so interested in going forward in search of goals that they forgot about Diego Maradona, the best player in the tournament. Well, there was one more goal all right, but it was for Argentina. The little wizard beat 5 German players with one pass, and took advantage of Schumacher’s horrible day yet again. The game ended. The trophy was lifted by Argentina. But the fact that Germany had come back from the dead, and scored two goals to tie the game with 10 minutes left, somehow changed the equation. I was full of hope. The sun was brighter. I wasn’t hungry. Maybe, just maybe, my Saturday afternoon heroes like Klaus Allofs, Olaf Thon, and Lothar Matthäus could win the trophy and become the best team in the world. Everyone left, and I sat there, alone in the TV room at my Grandparents’ house. I cried. I admit it was a little embarrassing, but I couldn’t help it. I had witnessed the effort, the urgency, the frustration all play out in 100+ degree heat with no time-outs, no huddles, no coaching strategy sessions to call a final play. Just 11 men working together as a team, carrying the hopes and dreams of their entire country. And witnessing their struggle – it drew me in. That’s why I love the World Cup. There is EVERYTHING to play for. Personal Pride. National Pride. Sporting Glory, Sporting History, and Sporting Immortality. It is the greatest sporting event of the greatest sport in the world, watched by more people than any other event on earth. It might take a game or two to warm up, or it might explode from the beginning. If you watch the games, you will be drawn in. But be careful. You may laugh. You may exult. Your team may become Champions of the World. But you also may shed a tear or two. 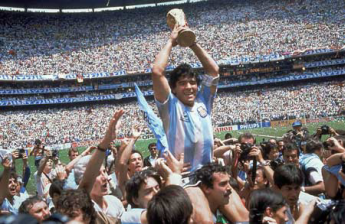 And after all these years, Congrats to Argentina. There, I said it. The Rolling Stones are re-releasing one of their best albums of all time, Exile on Main Street. This album was originally released in 1972. The band had to steal away to the south of France and record portions of it in Keith Richards’ villa due to drug allegations and tax problems back in England. Do many of you know or like this album? Personally, I have always loved it. It’s one of my favorites. But I have been a Stones fan for so much my life, that my favorite songs aren’t the ones that everyone knows. I’ve heard “Satisfaction“, “Get Off My Cloud“, and “Start Me Up“, etc. so many times that I sometimes forget how great these songs were when they were new. My favorite Stones songs are the hidden gems – the 3rd or 4th on the back side of an album – the ones no one ever really talks about. “Indian Girl” on the back side of Emotional Rescue speaks of the civil war in Angola and Fidel Castro, and a little girl that has no food to eat cuz the soldiers ate it. “Highwire“, track 16 off of the 1991 live album release Flash Point speaks about watching the first gulf war on prime time while eating TV dinners. These are great songs. Exile On Main Street has some of these hidden gems as well. Exile is a wonderful album that has songs ranging from gospel to blues to rock-n-roll. If you want to read more about the album re-release, check out this article here. Trust me, it’s worth the read. As for me, this album has one of my favorite Rolling Stones songs of all time, “Loving Cup“. 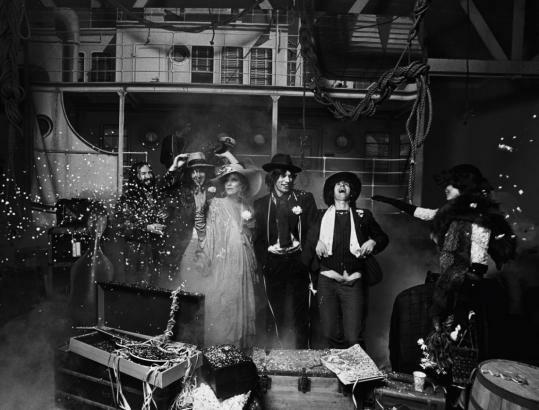 I would love to have some excuse to dress up like Mick, in the old 1972 garb, feather boa, gangster hat, tight-fitting black pinstripe suit, ankle-boots, ruffled shirt, and a little eye make-up….and go sing some of those songs. That would be Sweet Virginia. 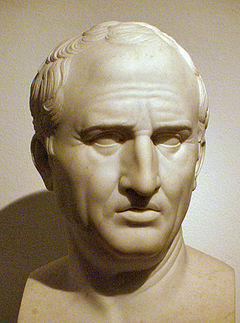 Cicero was an ancient Roman Consul. He served in the Roman government for many years. John Adams said that “all the ages of the world have not produced a greater statesman and philosopher united than Cicero“. In his works The Republic and The Laws, Cicero explains his thoughts on good government and leadership. 1. People should learn to do of their own accord what they are compelled to do by the law. 2. There is no other occupation in which human virtue approaches more closely the function of the gods than that of founding new States or preserving those already in existence. In his time, many of his wealthy friends wondered why he would waste his time in politics. His answer is that good, brave, and high-minded men get involved in order to not be ruled by wicked men, and not to allow the republic to be destroyed by them. There are so many people in our time that want to focus solely on making money and living “the good life.” For the most part, I have no complaints about this. But we also need to make sure and preserve the government that protects the freedoms and liberties we enjoy, not just try to get away with whatever we can and leave it to future generations to pick up the pieces. When I read “good, brave and high-minded men get involved in order to not be ruled by wicked men”, it made me think of my brother Greg. He’s a guy like most of America: he has a family, a job, hobbies and interests, etc. But he also gets involved in protecting our republican form of government. When the US Representative that represents Greg wasn’t voting the way most of the people in their district wanted based on their polls, he and his friends got involved. They made phone calls. They set-up websites and blogs. They called on their Rep for explanations of her votes. Their efforts were noticed by national media outlets and brought enough pressure on their Congressional Representative that she was finally forced to respond. I asked him about the purpose of his involvement. Was he planning on running for office? Other political aspirations? His answer was that he just couldn’t sit by and let the elected officials keep doing whatever they wanted, and not be held accountable. He just couldn’t sit by and let it happen. Is this Cicero ... or my brother Greg? One evidence of a Ruling Class taking over a country is when the rulers go against the wishes of the people who have elected them. Roughly 90% of Americans rejected the $700,000,000,000.00 ($700B) TARP bailout plan, but the Ruling Class pushed it through anyway. We the people also rejected a government take over of GM and Chrysler, but the Ruling Class went ahead and used billions of our dollars to do it anyway, paying preferred creditors pennies on the dollar, and transferred huge proportions of the newly formed companies into the hands of the United Auto Workers union. Yet another Chicago-style cronyism move by the current administration. If this isn’t going against the will of the people, I don’t know what is. This is government taking power into its own hands and doing what it wants against the will of the people, making huge transfers of wealth and often – like Geithner – feathering his own bed in the process. I don’t know what you call this type of government, but it is not a democratic republic. Can the US Government actually run a program without bankrupting it? And we are going to let this same Government run Healthcare? Even the Office of Management and Budget is reporting that the United States government will experience massive, non-stop deficits for the next 70 (SEVENTY) years, requiring the issuance of tens of trillions of dollars of additional debt. The OMB does not project even one year of surplus during the entire seventy year budget period. Link HERE. (And don’t even get me started that these budget numbers are already including $646 Billion in tax revenues from 2012 to 2019 from Cap & Trade, which hasn’t even been passed yet!) Has your elected official talked to you about that? You don’t have to answer. What is our Government’s response? Print more dollars. The US government has announced that during the fiscal years from 2010 through 2019, it will create an additional $9,000,000,000,000.00 ($9 trillion) in deficits, an amount that is almost certain to be understated by trillions given the country’s current economic trajectory. The government assumes that this vast additional deficit will be funded by others, such as the Chinese, as it is a statistical fact that the United States will be incapable of funding it. Link HERE. What does this mean to you and me? That our wealth (if we have any) is being destroyed. Create enough dollars and they won’t be worth anything. It’s a simple truth: too much of something makes it worthless. The more our government creates money to cover their RECORD SPENDING, the less valuable your salary is, the less valuable your savings are, etc. Our government is bankrupting us through this spending policy. I know we sometimes think the United States is a blessed country and more immune to these problems than other nations, but let’s not be naive enough to think that somehow supply and demand doesn’t apply here! And that the value of our dollars won’t be adversely affected by the Government printing trillions and trillions more of them! What can we do? Make a plan to protect yourself and your family. Don’t hold your assets only in dollars. Diversify into other things (land, gold, etc.) Even the Wall Street Journal is saying it’s a good idea to stockpile food. Link HERE. And let’s get these big spenders out of Washington. I’m not talking Democrats vs. Republicans. Vote people into the House of Representatives that will work to put an end to this spending. The House is the easiest access we have to the Federal Machine. Find people you can support that will work to stop this spending madness. It won’t be easy to stand up to the current machine that is playing party politics as hard as anyone has in recent memory, but we might as well try while our dollars are still worth something. Honestly, though, I’m not sure what kind of difference we can make at the Federal level until there is a massive reset (huge depression, market collapse, currency devaluation or failure, etc.) but this doesn’t mean we shouldn’t try. We can, however, make a difference at the local level. When our Federal government’s spending policies finally make it impossible to be the “be-all, end-all” throughout America — which it never should be trying to do — we will still need to make life work where we live. Getting involved at the local level will make a huge difference in how our communities adapt and move forward. What are your thoughts? What are other ways we can prepare for the inevitable problems facing the dollar due to government monetary policy?